Ideal for those who need elbow stability for mild to moderate medial/lateral and hyperextension injuries. Try our Brace Advisor for personalized product recommendations to meet your needs! This brace can be used for both right and left arms. Measurement - circumfrerence of arm taken and mid-biceps. I recently hyperextended/ dislocated my elbow during a football game. I need a brace that will prevent me from straightening my arm so that I can finish out my season. Does this brace adjust to different degrees of flexion/ extension? The hinge in this brace can be adjusted to limit motion however the stops do not come with it so they would have to be purchased seperatly by a medical professional or sales rep. I'm coming off of arthroscopic surgery, I have arthritis and am looking to continue my bowling career. I hook the ball a lot, which in turn puts quite a bit of stress on the elbow. This brace and the Bionic Elbow brace seem like good options, however I'm not sure which one would be the best to protect the elbow from further discomfort. I see it has straps coming across does this help limit the amount you can move your arm? just looking for a little resistance. those straps will limit elbow extension if you want it to. the tighter the strap the less you will be able to straighten your elbow. How can I wash this brace without ruining it? My doctor wants me to get an elbow brace that keeps my arm straight while I sleep. Which would you recommend? When measuring the mid bicep, should the arm be at flexion or extension? You should take the measurement with the bicep slightly flexed when measuring for the DonJoy Elbow Guard. How often should these braces be replaced according to manufacturers suggestions? Can the rom be adjusted to 20 degrees? Is it possible to get it with plastic braces on the sides instead of metal? My son wrestles, and he saw a wrestler wearing one of these that had plastic braces. No the brace only comes with metal hinges. Can I wear it in the water while kitesurfing? I have a football player injured with a hyperextension. The doctor says he needs mcl support for his elbow. Will this brace give this kind of support? Will the elbow guard allow my daughter enough flexiblilty to still compete in gymnastics? Thank you for your question. The Donjoy elbow guard will allow full mobility of the elbow. Your daughter would be able to use the brace for gymnastics. She may initially find it to be bulky particularly when her arms are by her head, however it will protect her elbow. Does this brace come in a pediatric size? My 9 year old recently dislocated his elbow while wrestling. He wants to continue wrestling but will need a brace after he has healed up. 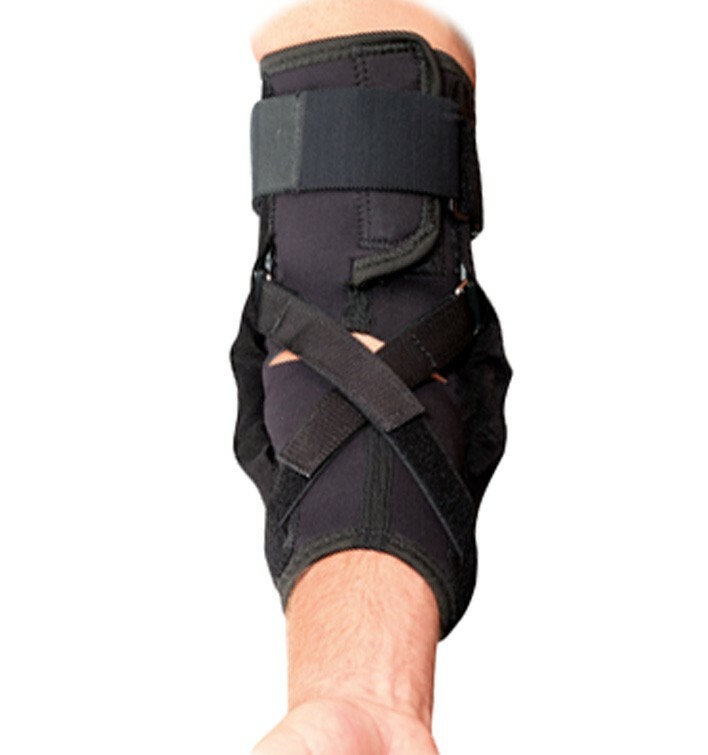 Is it legal to wear this brace while playing basketball? Thank you for contacting product support. NCAA rules state that you can wear a brace on your arm as long as it is adequatly padded. While the Elbow guard does not have any visable metal it does have metal hinges on both sides and you may need to ask a ref before the game if it padded enough for you to wear it. What kind of warranty comes with brace? Our soft braces have a 6 month warranty, our Rigid Knee Braces have a year warranty. Do u accept BCBS insurance ? If so how much is my portion, and my Dr. Has written a prescription for a brace. Please call our Insurance Division, they will better assist you with your specific Insurance questions. As an athletic trainer, I was asked to assist a wrestler in purchasing a protective elbow brace to prevent re-injury to a surgical elbow in a Varsity level Wrestler. This is the brace we chose. When it arrived, I was pleased with the product. However, when we placed it on the athlete, it was not as snug as I would have liked on the upper arm and the metal braces that run medially and laterally did not want to stay aligned properly on the upper arm with movement. They kept shifting and the athlete was getting "prodded" near the joint and on the arm because of the allowed movement. After 1.5 weeks of practice, the athlete came to me and showed me that one of the seams had already separated and the brace was tearing. Luckily, our Home Ec teacher was able to help us out and sew the neoprene back together...but I'm worried how long that will last. This brace may be suitable for an athlete playing a less physical sport with less body-to-body grabbing and pulling, however it is not exactly doing the job that I had hoped. Excellent brace! Fits to size. My grandson had to have this after major surgery on his arm. No problems while he is wearing the brace. Pros: Good fit - fits to size. Strong. Maintains support - no sagging or stretching out. Cons: None, as the brace is everything it was advertised to be.